Ask anyone what irks them the most about their printer and chances are they will say the same thing: expensive ink cartridges. 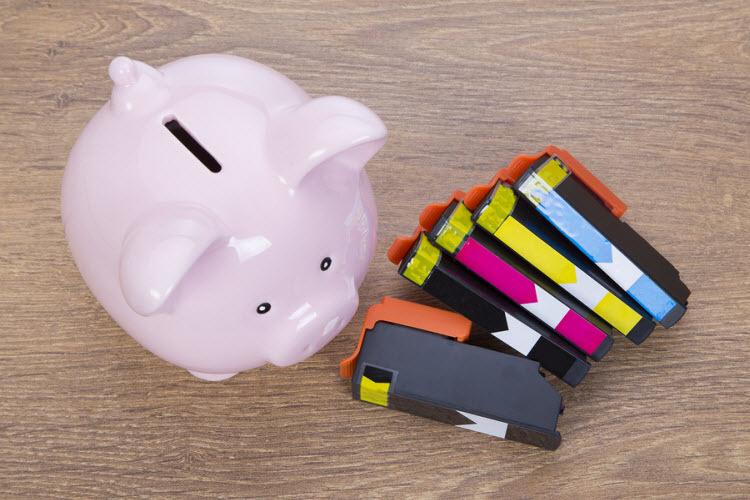 The amount of money you spend on ink cartridges can easily add up to more than what you originally paid for the printer itself, especially if you have one of those budget-friendly models. Counter-intuitive as it may sound, a lot of small businesses can save money in the long run by purchasing a more efficient printer, even if you have to spend a little in the process. How do you decide when it’s smarter to replace your printer rather than buying ink for the one you got? Let’s say you have an Epson Expression Home XP-330 All-in-One printer in your home office. Each black ink cartridge purchased from Epson produces around 175 pages and costs $12.99 before shipping, taxes, and fees. If you’re printing 1000 pages a month, that equals approximately 5.7 ink cartridges or $74.04 per month in cartridges. Compare that with the Canon PIXMA MG3020, which uses PG-243 ink. This cartridge produces 300 pages before running dry and costs around $15.99. When you’re only printing 1000 pages per month, that totals out to 3.3 ink cartridges per month or $53.30 in ink. That’s $20.74 per month in money saved, just by switching to a more efficient printer. At that rate, you’ve covered the $49.99 Canon’s MG3020 costs in less than three months. If you’re printing two or three thousand pages per month, you can quickly justify buying an office-grade printer with four month’s worth of savings alone. Not printing a thousand pages? The amount you save is the same, just spread out over a longer period of time. Apply this money saving principle to any model or brand by dividing the number of pages you print monthly by the pages-per-cartridge yield, then multiplying that by the price. Voila! However, before you run off to your local Best Buy, there’s more to your decision than pure by-the-numbers efficiency. Often, the printer that saves you money may not produce the same quality as your old model. Maybe your new printer doesn’t come with some features you frequently use. And sometimes an ink-saving feature looks good on paper but ends up costing you more than simple solutions in the long run when put into use (take, for example, EcoTank technology, which we’ve touched on previously here). Third party compatibles. Aftermarket cartridges are so much cheaper than their name-brand equivalents–sometimes as much as 75% cheaper! Before you drop the money to replace your printer, check and see if you can get alternative ink for your existing printer. You may save enough to justify keeping the old printer around for a little longer. When you’re shopping for a new printer, ensure that you can get generic ink for your new model, too. If you can easily find third-party ink compatibles for your old printer, but can’t find any for the new unit, you may not be saving much at all. You may even be spending more at the end of the day! Ruggedness. Not all printers are designed with the same user expectations. A printer that is perfect for your home office will quickly buckle under the stress of day-in and day-out workplace printing. Before you purchase a new printer, compare how much you regularly print to that model’s monthly duty cycle. Going much over the manufacturer’s expected workload will cause your new printer to degrade quickly, which means costly repairs and even a premature replacement. XL cartridges. Nearly every printer manufacturer today offers high yield XL ink cartridges for several models that hold two, even three times more ink than standard cartridges. XL cartridges give people who print more an option to buy more ink at once, and they are often quite cost effective. Replacement parts. Take a look at the replacement cost for print heads and allow that to factor into your decision, too. Different manufacturers take different approaches to design, and those decisions can impact both the quality of component pieces and how much they cost to repair. For example, Epson uses a fixed print head design, in which ink cartridges slide into a fixed carriage. This allows for the print head to be made with higher quality component pieces, but also means that, when it breaks, it is more expensive to replace. Repair cost matters little when you’re buying a forty-dollar home printer, but if you’re looking for something office-grade that needs to last . . .
Quality control. In other words, not every printer is built to the same standard, and often design flaws make troubleshooting a task. Check reviews online and see if customers share common complaints. If a disproportionate number of people express displeasure with a major component, such as the print head or feeding system, you may want to find another comparable model with better reviews. New features. Your older printer may be plenty efficient, but lack some of the new technologies that can make your day to day work easier. The way we do business is always changing, and new features like easy connectivity with mobile devices can make a big difference. Small expenses add up quickly when you run a small business. Thankfully, small adjustments can make a big difference when it comes to protecting your bottom line. Saving twenty or thirty dollars monthly doesn’t seem like much, but over time it adds up to a pretty hefty total.